Did you know you can eat just the mooncake skin? And how do you cut a mooncake? Find out here. #1: Mooncakes – the agent of revolution? A popular mooncake legend is that Ming revolutionaries, needing to secretly coordinate a revolt against the ruling Mongols, spread a rumour that a deadly disease was on the rise and mooncakes were the only cure. Thus, no one batted an eyelid when mooncakes were quickly distributed to the people. When they were cut open, a hidden message told recipients that the revolt was set for the 15th day of the eighth lunar month – the day we now celebrate as the Mid-Autumn Festival. Like the baked mooncake skin but don’t like the dense fillings? Traditional mooncake dough is often baked into fish or piglet shapes, put into small brightly coloured plastic baskets and sold as sweet, chewy snacks. It represents caught fish or piglets bound for sale. Snow skin mooncakes were created in the late 1960s after a demand for ‘healthier’ mooncakes. 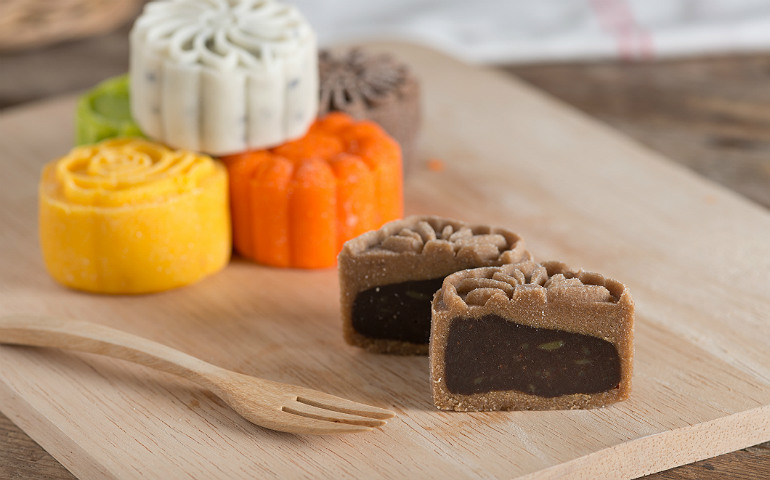 People felt that traditional baked mooncake fillings like salted duck egg yolk and lotus seed paste, along with the lard and sugar syrup used to make the crust, made the mooncakes high in sugar and oil. Therefore, the crust was replaced by glutinous rice, the fillings were replaced with fruit, and the no-bake snow skin mooncake was born. If you do, they can last up to a week, though most advocate eating them within three days. The consistency and taste will be very different if consumed unrefrigerated and they may even spoil. Mooncakes are usually cut into eighths with a clean plastic knife. Be firm when slicing to avoid everything crumbling. It’s said that messages were once printed on top of a set of four mooncakes and they had to be sliced and pieced together to form the message. The evidence was then destroyed by eating them! This one’s a no-brainer, but is still worth mentioning for potential savings. The best time to start buying mooncakes from hotels is around early to mid-August – most will have their promotions out by then and will offer early bird and bulk purchase discounts. You can also specify a collection date. Actual mooncakes aside, how they are presented is becoming increasingly important. Since mooncakes are commonly given as gifts, especially between businesses, first impressions count and that’s where the box plays its part in the ‘wow’ factor. There’s a reason mooncakes are cut into slices – they can be overly rich if you try to eat too much at once. Our preferred option is to sample a slice from different types of mooncakes to taste the greatest variety possible without sacrificing too much stomach space! 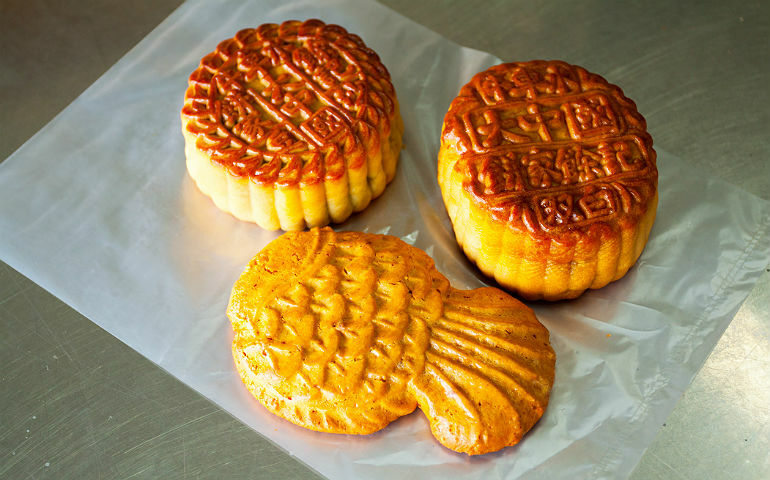 Despite usually not containing any pork , mooncakes aren’t always prepared in a halal-certified manner – and some baked mooncakes use lard – so it’s best to check with the seller before gifting them to Muslim friends.